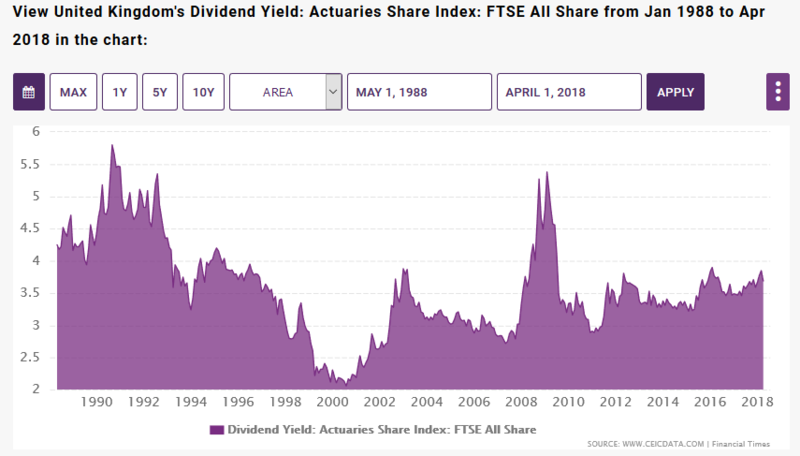 For some personal research and interests, I am looking for the historical (from '90) dividend yields of the FTSE 100 and/or FTSE All Share Index. Do you have an idea where I can obtain them? I'd go first to the website of the London Stock Exchange (LSE) to see if it shows such historical data. If it doesn't, then ring the LSE press office and ask which data providers might have such figures easily to hand. Alternatively, go to the website of the FTSE Russell group which actually compiles and publishes the data and look for it there - or ring them and ask. And keep us posted with what you uncover in this topic. Would be useful information to keep a reference to. For some personal research and interests, I am looking for the historical (from '90) dividend yields of the FTSE 100 and/or FTSE All Share Index. Do you have an idea where I can obtain them? Avantegarde wrote: Alternatively, go to the website of the FTSE Russell group which actually compiles and publishes the data and look for it there - or ring them and ask. Found that website as well, but indeed, the paying part is the minus. Just requested the 10 day demo. Hopefully it'll give me access to the information I am looking for, and not just a small preview. They would only give it to me if I would need it for my PhD research. Unfortunately, that is not the case for me. However, I managed to obtain it (quite easily) from DataStream, as soon as I could use DataStream.